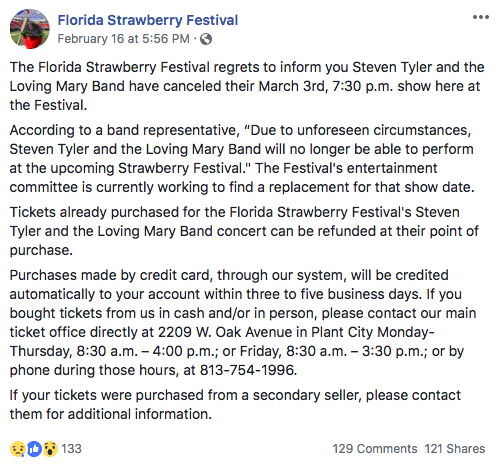 Aerosmith’s Steven Tyler cancelled his upcoming performance at The Florida Strawberry Festival this March with little explanation. Tyler was slated to perform with the Loving Mary Band at the festival on March 3 in Plant City, Florida. He was arguably one of the top-selling performers, dominating the highest-priced tickets this year. However, over the weekend, the festival released a statement which noted that Tyler had to cancel his gig due to “unforeseen circumstances.” No other details regarding the cancellation were given. Tickets will be refunded at point of purchase. Currently, the festival is searching for a replacement for Tyler; last year, DNCE and Cam backed out, and The Band Perry called-off their performance in 2017. The festival, which runs from February 28 to March 10, will feature sets from performers like Willie Nelson, Brothers Osborne, Old Dominion, For King and Country, and Styx. Alabama, Martina McBride, Chris Janson, and Keith Sweat will also take the stage. Tyler’s performance was set at $55 – other performers’ tickets, which range from $20 to $45, vary per night. For more information about the festival, visit flstrawberryfestival.com.